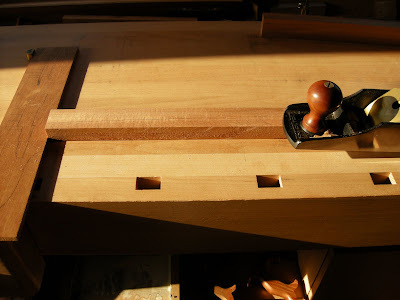 Because the legs are quite thin on this little project and the tenons are sort of long and skinny, I decide to use my brace and bit to remove the bulk of the material before turning over to my mortise chisels. 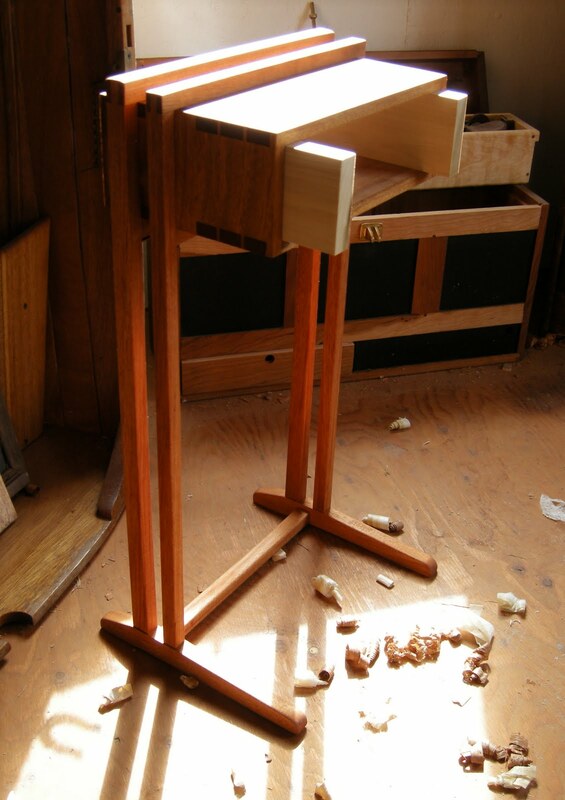 The brace is fast and the material bores away in seconds; the ends of the mortises still need to be squared up and the depth cleaned a little. These mortises are a relatively painless and fast process using this method and I’ll do a test fit to see if I need some more fine tuning. I’m pleased with the look of the piece with the feet attached. It’s rewarding to see it coming together and finally standing on the shop floor in front of me. Until now it was only an idea, curiously being watched and studied as the form was taking place. I decide to shape the feet beginning with the long tapers from the front leg to the toe and again a shorter, quicker slope down to the heel. I begin with the taper and my smoothing plane…in a minute or two I get down into the Khaya and meet my scribe lines to reveal the lines of the feet. From here I take my coarse rasp and do some more shaping at the toe to round things over. I follow with a finer rasp and again stand back to see if I like where things are going. 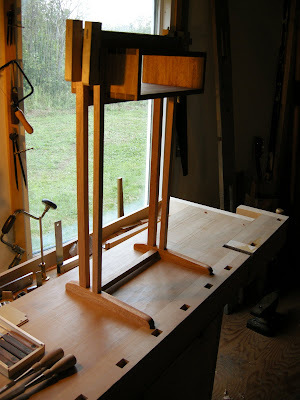 I decide to add a bottom stretcher to add some stability to the frame. 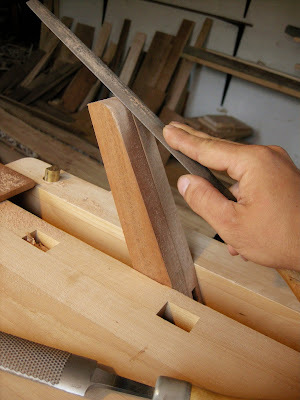 Again with a brace and a bit and the mortise chisel dance, I’m there. 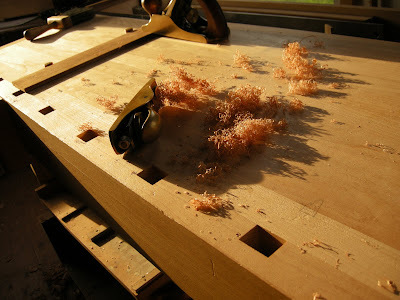 5 a.m. sunlight pouring into the wood shop makes those tiny chamfer shavings come alive. 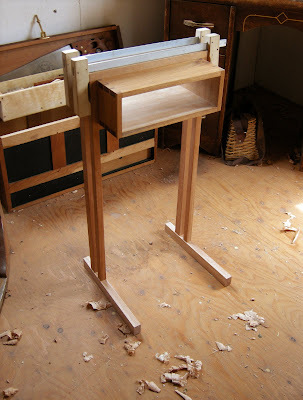 Like a camp fire dancing across the bench top I’ll break all of the edges and decide to add a small bead detail to the mid-stretchers just under the drawer box area. This is one of those details that you’d only find when you really stop and take a closer look at a piece of furniture. From a standing perspective you’d never see it do to the overhanging drawer box section; but when we crouch down to look closer at the lines in the hardwood, only then may we discover these tiny little details, hidden treasures kept away from eyes that are simply wandering by. These are the elements and reasons we work the wood; it’s these small trophies we keep hidden away for others to discover. 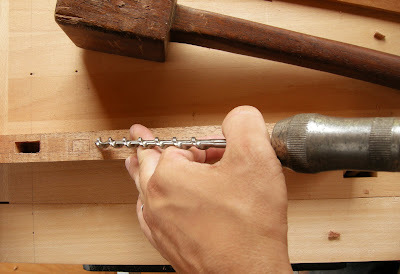 My beading tool, an older model from Veritas is simple in use, easy to set up and a pleasure to work with. A gentle touch to begin I slowly work my way down into the wood grain being careful not to tear as I go. When the beading is done and the final surfacing completed I’ll go ahead and glue things up. I leave the wood shop for the remainder of the day and this evening I’ll come back and remove the clamps, clean up any squeeze out and fine tune the joinery. The next day came and went and maybe a few more as well…getting sidetracked away from the project for the far more important things in life: sand castles on the beach, destined for higher tides to come and wash away those tiny little foot prints left on the strand. My children, 3 and 4 years of age, having the most incredible time of their young lives; through the campfire ghost stories and summer songs being sung- visiting friends and family all come to enjoy these days that we spend time in our home out there on the coast in Cape Breton. When I finally arrive back in the shop I like what I see…this strange little table affair, ‘a side server’ I now call it; do to the fact that is what it became. A natural progression not following any rules- a kind of evolution in design. I rummage through some off cuts and find a great piece of Angelique just big enough for a drawer front. 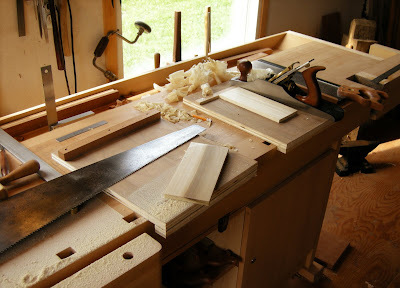 I’d also discover some Poplar and fit it to size, the first step in making a traditional drawer is to get the drawer sides to fit the opening. I’ll plane the Poplar so it ‘just fits’ and from there I’ll have to re-saw the stock. Funny now thinking back to a year or two ago, the thought of re-sawing a piece of lumber by hand was so far from my mind. 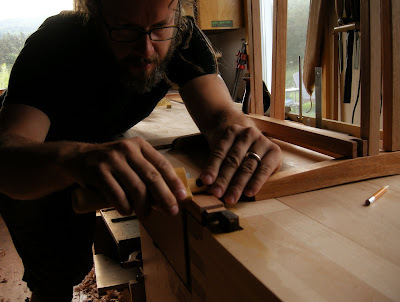 I don’t know exactly when it happened but at some point over the past 14 months my mind shifted from…“How am I ever going to do all of this or all of that with only hand tools?” to these long summer days of simply doing the work and never giving it a second guess. 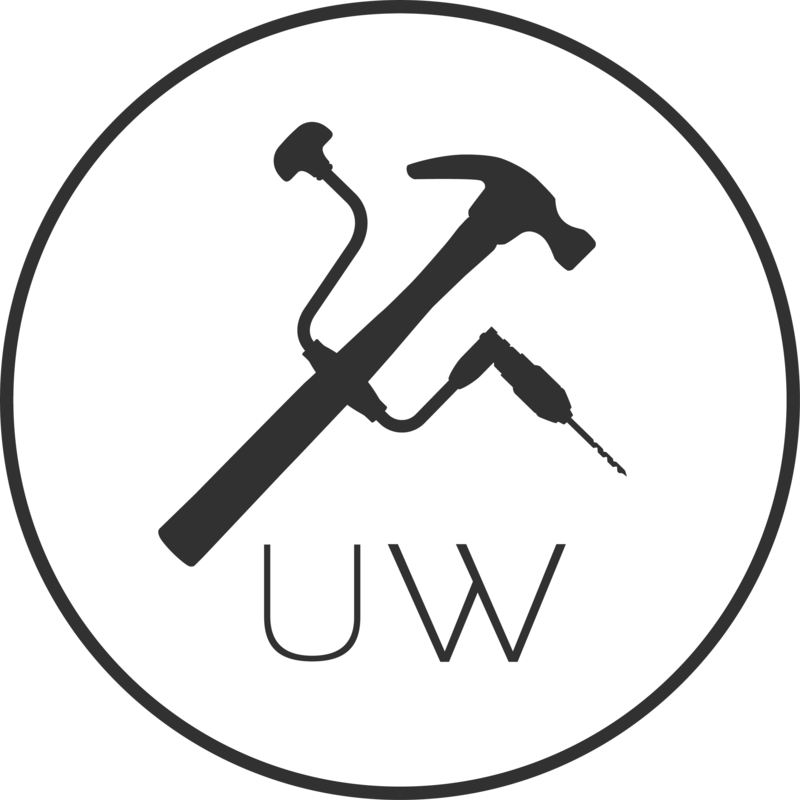 Working with hand tools now is so natural and for anyone out there who is still at those early stages where you still may want to talk yourself out of dimensioning all of that lumber by hand…you’ll get there, believe me-it’ll come sooner than later. These days it seems just another quick process in getting the wood ready for joinery. My rip saw makes quick work of the challenge and from there it’s a frenzy of bench hooks and hand planes. Surfacing the freshly sawn surfaces and then shooting board to ready. My Bad Axe saws arrived around this time and I was so excited to finally get them in my hands. 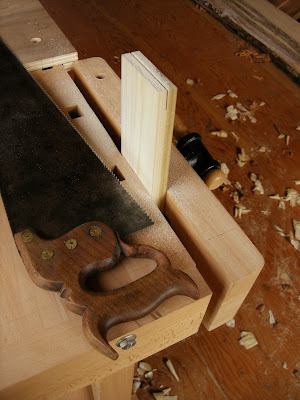 Again, the little side server would have to wait a few more days while I put the new back saws through some tests. The saws as I mentioned in an earlier post are two of the nicest I’ve ever had the pleasure to work with. They’re really everything you’d need in a handsaw. Another week passes and suddenly we’re closing in on our vacation time, I think about the Oak door waiting back in the city. Almost time to shift gears and make tracks but I did want to finish the project at hand. 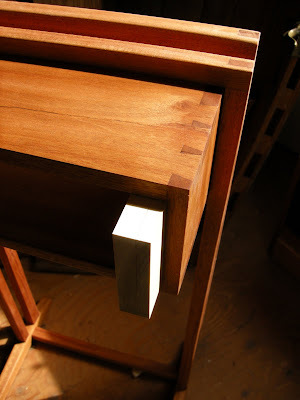 The top tray was pretty straight forward, the main tray with two wide ends attached by split mortise and tenons. What I did end up doing, that I thought was kind of cool, and again another Krenov thing, was before I attached the bread board ends I rabbeted a small groove along the inside edges of them where they meet the main top surface. This created a shelf that supports the drawer when it comes to rest on the tray. The drawer in turn, never touches the tray top but sits firmly in these little rabbets. The idea came from Krenovs ‘silver ware cabinet’. 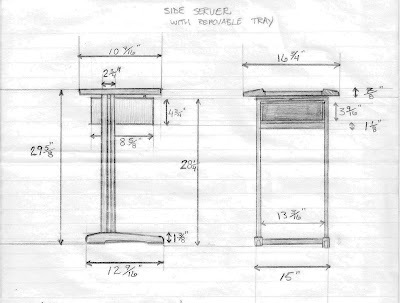 His piece is designed so the drawer will rest, just floating above the surface…his silverware case doesn’t have a removable tray and besides this obvious detail there’s nothing about the two pieces the same. I should also mention how the tray connects to the top? I simply ploughed out some deep grooves to correspond with the two top stretchers on the main frame. I was hoping that these two stopped dados would be enough to balance the top and the tray would kind of ‘float’ when in place. This never panned out. When I placed anything on it, it would fall slightly forward touching the drawer box. 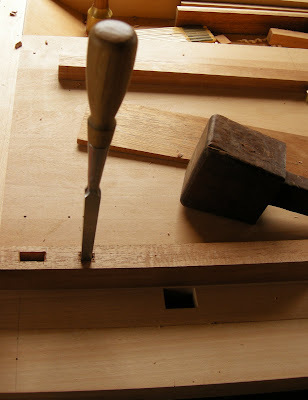 A quick fix…I drilled a small hole in the top center of the drawer box and inserted a dowel. This dowel is enough to keep the tray balanced and secure when it’s placed on the upper frame assembly. at the stove you can go over and again, push out the little drawer, place it in the grooves and carry the whole tray over to your work space. Then remove the drawer with all of it’s nicely fitted interior components and use the tray as a work surface…a cutting board perhaps? I’ll leave it at that for now and promise to get a few shots of the piece next summer…the way time flies it won’t seem too long. I apologize for taking you so far into this piece and never having a final picture of it. Here’s a sketch I did before I left, hopefully it’ll get the ideas across and you’ll see what I did. I’m happy to hear you enjoyed it ! Great post series! Welcome back Tom!. ………. and they keep bouncing back to me. I am keen to discuss something with you but can’t seem to establish contact. thanks for letting me know- not sure why they’re not coming through? Fantastic! A real treat! A thrue Krenov approche! I love working that way!